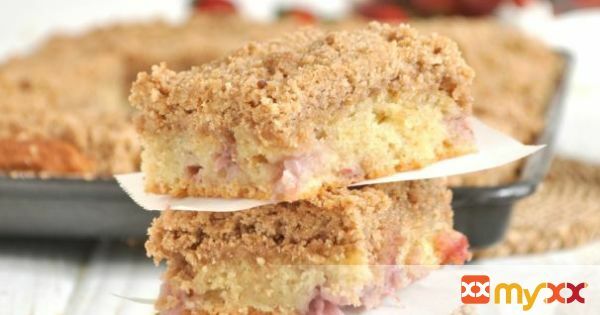 A moist and strawberry-packed cake with a delectably-thick layer of crunchy streusel leaves little to desire except for a looser jaw (I'll point to YouTube for that tutorial). 1. Cut the butter into medium cubes and place them in the freezer to firm up. Once the butter is completely frozen, put all the streusel ingredients in a food processor and pulse it until the mixture resembles fine sand. Keep in the freezer while you prepare the cake. 2. In a large bowl, dump all the dry ingredients. Whisk it a little to get rid of any noticeable lumps. 3. In a separate bowl, beat more butter until pale and smooth, about 1 minute. Once the butter has softened and you've thoroughly beaten it, add the sugar and continue to beat until fluffy, about 2 more minutes. 4. Add the eggs one at a time, incorporating them completely before each addition. Add the yogurt, milk and vanilla extract. 5. Rinse, dry, hull, and cut the strawberries into small, quarter to half-inch cubes. 6. Add them and the dry ingredients to the wet mixture. Gently fold the strawberries, dry and wet ingredients together until just before all the flour is incorporated (this will ensure you don't overmix). 7. Preheat the oven to 350F. Line the bottom of a 13x9x2 inch baking tray (it's the one for cookies) with parchment paper. 8. Spread the batter evenly all the way to the edges. Retrieve the streusel from the freezer and generously sprinkle (more like pack) a dusting (more like mountain) of streusel over the cake. 9. Bake for 45-50 minutes, or until the streusel is dark-golden brown and an inserted toothpick comes out clean. 10. You must let it cool for a least 30 minutes before you dig in.